Note: this article appeared in the Poughkeepsie Journal on July 7, 2016. All photos are courtesy of Ellen Crain. You can link directly to the article. People often ask if our farm sanctuary can provide a home for their roosters. In many cases, they purchased baby chickens with the expectation that they were all young hens, but at least one turned out to be a rooster. Then the individuals found out that their town, responding to complaints about roosters’ noise, bans them. So they hope we can adopt them. 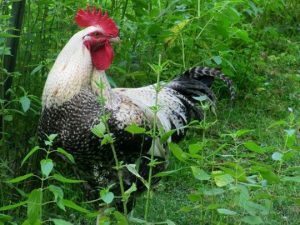 We have taken in as many roosters as possible, and we have learned that although they often present problems, they possess admirable qualities. Most of our roosters have had a strong aggressive streak. A few have fought each other so fiercely that they have drawn blood. We have had to build separate aviaries for them, placing each with a separate group of hens. The ferocity of one rooster, Reggie, is a legend on our farm. Abandoned in a park in Yonkers, he spent two months in a rescuer’s basement before he came to us. On our farm, Reggie battled every rooster who came near him, and he went after us as well. He plowed into our legs like a football player making a tackle. Whenever we entered his area, we had to be vigilant and ready to step out of his way. But Reggie also exhibited a different, chivalrous side that is common to roosters. When Reggie saw food, he called the hens to it and never ate until all the hens had finished. When his group ventured into an outdoor pasture, he stood guard while the hens joyfully foraged in the grass or fallen leaves. Then, when he felt it was time, he directed the hens back to the safety of their aviary. Because of a chance event, Reggie stopped attacking me. One afternoon a turkey, a tough female, wandered near him. Just as the two were about to fight, I grabbed the turkey and carried her away. She let me carry her because we had known each since she was a baby and she trusted me. After that, Reggie never attacked me again. I can’t be certain why his behavior changed, but he seemed to have gained a new respect for me. 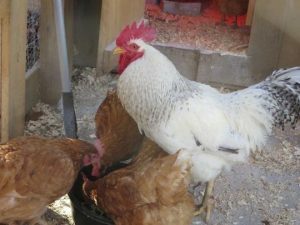 Recently I witnessed a stirring example of a rooster’s protective behavior toward hens. While driving my car, I saw a large pen with chickens inside. To my surprise, there was a raccoon inside as well! Standing between the raccoon and the hens was a rooster. He and the raccoon were staring at each other. If the raccoon wanted to kill any hen, he had to get past the rooster. The rooster’s bravery was something to behold! This face-off continued long enough for me to get out of my car and throw a pebble toward the raccoon, which scared him away. I then informed the owner, who went to fix the hole through which the raccoon had entered. Roosters are famous for their crowing. On our farm they crow at dawn and throughout the day. The young children who visit our farm are thrilled by the crowing and try to imitate it. Many adults, in contrast, regard it as a nuisance. When my wife, Ellen, and I opened our farm, we, too, expected to be disturbed by it. And our roosters did wake us up earlier than we wished, but this only happened the first two mornings. Moreover, we soon began to feel that the crowing is somehow inspiring — a feeling shared by others who work with us. 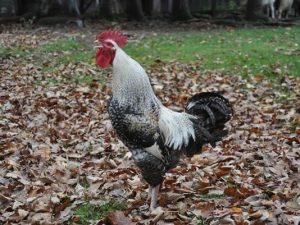 I suspect that people who favor town bans on roosters have endured many noxious mechanical sounds, such as lawn mowers and leaf blowers, and they don’t want to be disturbed by roosters as well. But the rooster’s crow isn’t part of the mechanical world. It comes from nature, and it’s an affirmation of life. I wish those who support bans on roosters would reconsider.